Cable and Satellite subscriptions are feeling somewhat irrelevant in the modern world, why do we need to spend over £50 a month for 300 channels of mind numbing garbage when a £5.99 subscription to Netflix gives you access to binge view high quality TV shows like Breaking Bad and House of Cards. Although the first season was somewhat of a slow burner that rewarded those that invested their time, the second season exploded in the opening episode, but don’t worry, there are no spoilers to be found here. One of the more fascinating aspects of the show is how they include the use of text messages with an overlay. A few years ago it had been notoriously difficult to convey to the viewer what a character was reading on their phone and the audience were left squinting trying to read quickly from a dull and dimly lit phone, normally of the Nokia variety. However we are all used to multitasking now and in these days where innovation is paramount, it’s great to see how House of Cards handles this subtle problem by showing little pop up bubbles on screen in real time as the character sends and receives text messages. This audio-visual storytelling method of illustrating human interaction with devices such as computers and phones feels incredibly innovative and shows just how our brains have progressed in processing information on screen now. In our own lives, most people effortlessly hold conversations with people whilst also tap away on their smartphones sending messages to someone else, and although this may have been seen before in shows like Sherlock, the way in which the relatively new method is used in House of Cards works perfectly. I believe this overlaying technique can be traced back to David Fincher’s Fight Club back in 1999 where Ed Norton talks about his obsessive shopping and as he flips through an Ikea catalogue, product descriptions pop up next to the actual product in his apartment giving the viewer a better understanding of the films character. 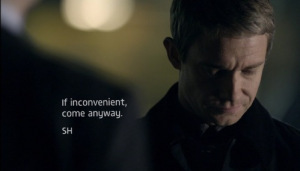 BBC’s Sherlock employed something very similar, using an overlay to provide the audience with a glimpse of text messages that allowed the audience an extra insight into both the character and the scene. I suspect there are many film-makers making notes and we will probably see this technique imitated and overused in the near future and a quick look at the trailer for the new Liam Neeson film Non-Stop seems to confirm that the use of text message overlaying in scenes is rapidly becoming ubiquitous but right now it seems that Netflix are pushing all the right buttons and more importantly boundaries that have restricted so many shows in the past. How we view entertainment is evolving and the ability to watch high quality shows like House of Cards when you want, where you want and whatever device you want for £5.99 a month will ensure that this viewer will be turning away from conventional TV with its weekly offerings of soaps, reality shows, adverts and obsessions with Z-list celebrities. You don’t need focus groups to tell you that there are a growing number of people who feel the same so let’s hope that they pay close attention to the constantly evolving medium and that change or clinging to business models of yesteryear will no longer work.